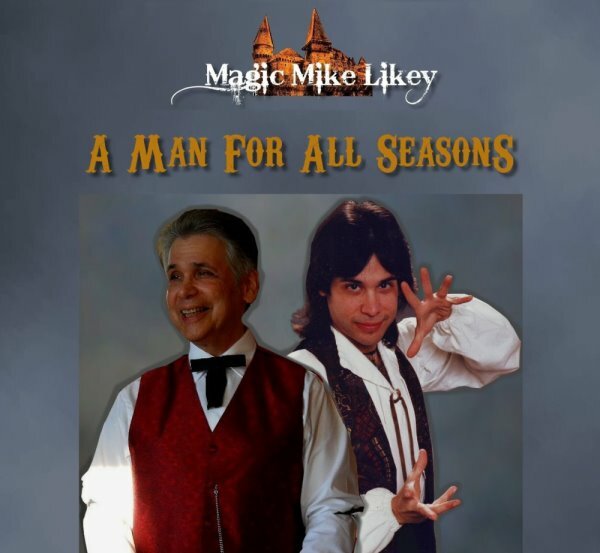 Bev Bergeron is a world-famous Orlando, Florida, Disney World magician. He is known as an inventor of tricks, and successful entertainer. For these reasons I was exited to watch his show in 1989 at the "Red River Exhibition" in Winnipeg, an agricultural fair, whose equivalents include Toronto's "Canadian National Exhibition", and Vancouver's "Pacific National Exhibition". 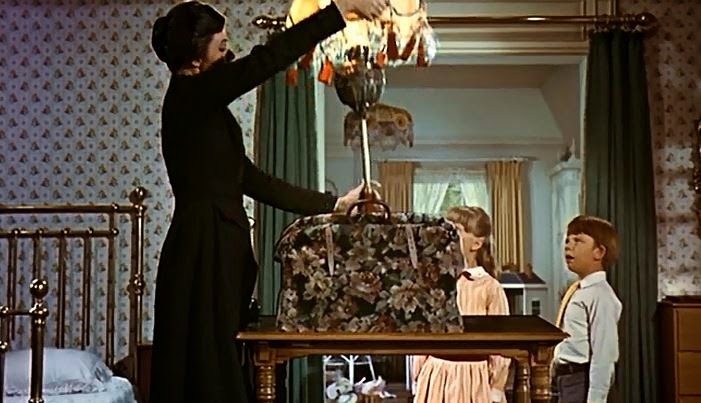 What struck me immediately, was that Bergeron walked out on stage with an oversized carpet-bag, also known as a "Mary Poppins Bag". 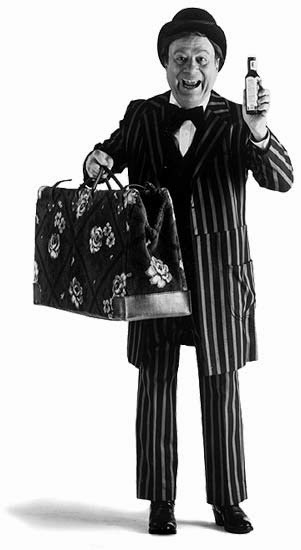 He worked his complete act out of this large, attractive, tapestry bag, wearing a sort of "huckster/pin-stripe suit" . I've always had a fascination with carpet-bags, perhaps because they look so old and magical; how many times have we seen on television and movies magicians, witches, and other interesting characters carrying one, pulling from it potions and other magical artefacts? There is a sort of mystique about carpetbags, and I made up my mind right then and there that I would acquire one for my period-themed magic shows; up until that point, I'd been shlepping around a cumbersome trunk on wheels; how convenient and magical-looking would a carpet-bag look in my shows, what with colourful props and silk handkerchiefs coming out from it? I was once again obsessed. As luck (or fate?) would have it, modern carpet-bags, and carpet-bag luggage was all the rage in 1989! All I had to do was walk through any luggage department of almost any department store, and strike gold! "The Bay" in Winnipeg was my first stop, and 'lo and behold, there it was: the bag that would house, transport, and be instrumental in the look and execution of my live magic-shows! It was beautiful: a brown, paisley tapestry material, with brown leather handles! It even matched my medieval costume, with it's white and brown suede "feel". This bag went through hundreds and hundreds of shows, and one of the handles was beginning to wear; I decided it was time to go back to The Bay and buy a spare one. This was easier said than done, as this style of luggage was beginning to wane in popularity; I had no choice but to buy a grey-paisley tapestry bag, but this one had longer handles, (a more feminine/hand-bag-look to it) but I didn't care, this would be the next bag once the current one wore out and would be retired to that great magic museum in the sky. The wonderful thing about this bag was that it housed all of my children's show props with ease; it even had a couple of interior pockets for carrying spare balloons and smaller props! Furthermore, I made my show even more self-contained by carrying a folding side-table (known in the trade as a "Harbin" table) in the bag as well! The bag and my Cittern in it's case completed my set up, both of which I'd throw into my hatchback and drive to a half-dozen shows in a day, back in the day. I must admit I started to get a bit carried away with the "self-contained" theme (ie- not needing any additional tables or chairs once I arrived at a show, by screwing folding TV-dinner tray legs to the bottom of my guitar case, so that the case would rest on its own legs so-to-speak, while my carpet-bag rested on it's own tripod-stand, which was screwed/attached to a flange at the bottom of the bag; the whole idea of spontaneity (ie-the bag sitting on a chair) seemed lost, so when I switched to the newer grey bag, I dropped the use of a tripod-stand for it to sit on. 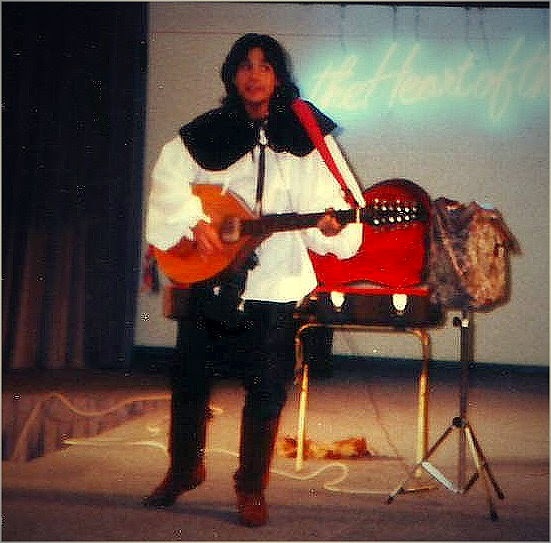 I debuted the set-up during the week of Halloween 1989 at a mall show in Winnipeg; it was also the first time I sang an original warm-up song, "You Can Do Anything You Want", which later became one of the theme-songs of one of my TV-shows, "Magic Mike & Company". Depending on the size of the venue, I alternated using my carpet-bag with my trunk for housing and transporting my props in Winnipeg from 1989 to 1994, then into Vancouver shows from 1994 to 2004. 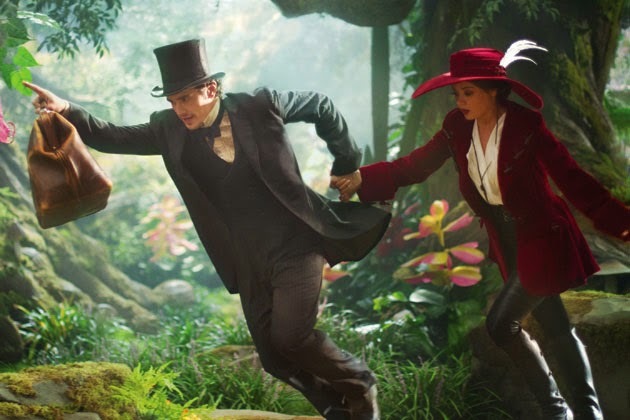 I loved hearing the kids commenting that I "had a Mary Poppins bag", especially when I pulled an umbrella out of the bag to do a particular illusion...what a perfect tie-in! The illusion, by-the-way, is Abbott's "Mutilated Parasol". I'd like to share at this point, a brief history of carpet bags in general. A carpet bag is a traveling bag made of carpet, commonly from an oriental rug, ranging in size from a small purse to a large duffel bag. The "carpet bag" was not invented as a pocketbook or handbag for women. Rather, it was the day's version of our modern "suitcase" that operated as a reliable traveling companion and carrier of a person's possessions. Such bags were popular in the United States and Europe during the 19th century. They are still made to this day, but now typically as women's decorative small luggage and purses, although typically no longer out of old carpets. Carpet was the chosen material because, during the time, carpet in homes was a popular accent piece and the "remainder" pieces were easily bought to use for the construction of carpet bags. In a sense, the carpetbag was a sustainable invention because it used remnants of materials which otherwise would have gone unused. The carpetbaggers of the Reconstruction era following the American Civil War were given their name from this type of luggage which they carried from the Scientific American Supplement, No. 561, October 2, 1886 "The old-fashioned carpet bag" is still unsurpassed by any, where rough wear is the principal thing to be studied. 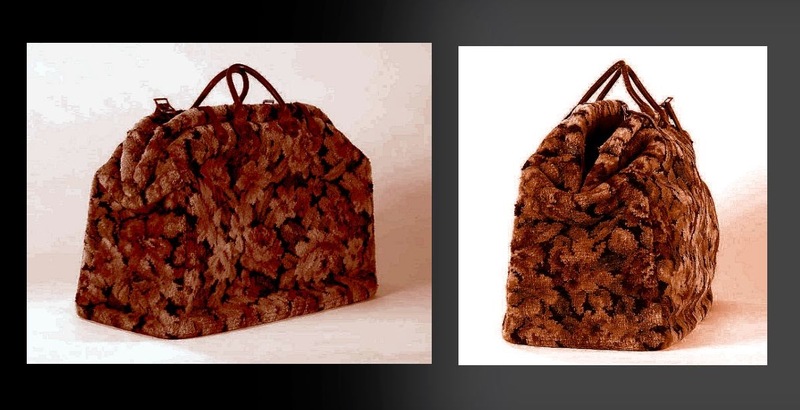 Such a bag, if constructed of good Brussels carpeting and unquestionable workmanship, will last a lifetime, provided always that a substantial frame is used. After my hiatus from magic to earn a masters degree, then three doctorates in metaphysics, (I am Rev. Dr. Michael Likey, by-the-way...a clinical hypnotherapist, and Doctor of Theocentric Psychology among other things), I caught the "magic bug" again almost two year ago! To become obsessed with leather doctor's bags as an extension of my love for carpet-bags wasn't much of a stretch, thus, I own several standard black-leather doctor's bags, a beautiful brown leather one, and a vintage, (1920's, in almost perfect condition!) oversized leather doctor's bag imported from England, purchased through E-Bay. My intension was to replace the feminine-looking grey-paisley, long-handled tapestry bag with a larger, more masculine-looking, brown-leather doctor's bag, which suits me more nowadays. 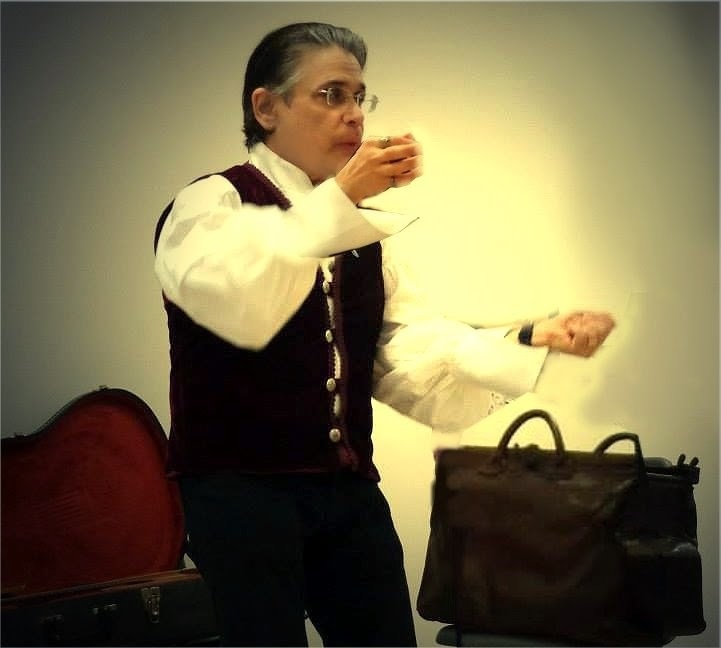 You'll almost always, when attending one of my live magic concerts these days, see me with either the large doctor's bag, or my steamer/upright trunk on wheels, and my Cittern or Dulcimer case, unless it's a non-period show, in which case, I'll have either my Ovation or Epiphone guitar, and props in the trunk or the bag. I should mention a brief history at this point of the Gladstone bag. A Gladstone bag is a small portmanteau suitcase built over a rigid frame which could separate into two equal sections. Unlike a suitcase, a Gladstone bag is deeper in proportion to its length. They are typically made of stiff leather and often belted with lanyards. The bags are named after William Ewart Gladstone (1809–1898), the four-time Prime Minister of the United Kingdom. Hinged luggage was first developed in the late 19th century. The first Gladstone bag was designed and manufactured by J G Beard at his leather shop in the City of Westminster.Beard was an avid admirer of Gladstone, and named it to memorialise his name. Though the Gladstone bag developed into the typical flat-sided suitcase of today, modern leather versions are marketed which in fact are not Gladstone bags. Often these modern bags are made with soft, rounded sides, only opening at the top. This incorrectly named Gladstone bag is actually a kit bag, or a square-mouthed bag. 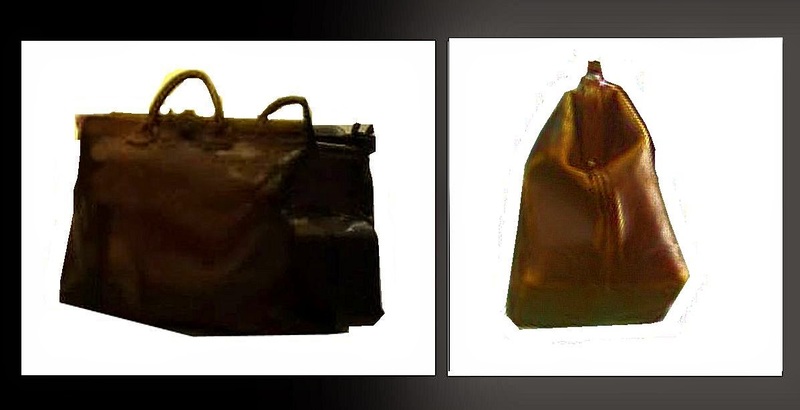 The Gladstone bag has been mentioned numerous times in literature by Arthur Conan Doyle, J.D. Salinger, Tennessee Williams, Oscar Wilde, and many more. There you have it! I guess you can say that magic is truly my "bag".